Three days after The Injection. Odd issues at times. Hot flashes. Excessive trips to the restroom. And a lack of solid sleep. But a silver lining to this cloud of mine: no more pain! No more tender spot. No more stabbing when pulling the left foot up. Everything feels normal. For the first time since February. Been stretching aggressively and staying hydrated. Planning on checking with a local PT that specializes in optimizing runners. And getting Brother Jason to do some massage work to lengthen my hamstrings. If all that can contribute to a better running experience, my triathlon season won't be a total bust after all! Celebrated with a waaaay sloppy cheat meal during lunch. Big O's Sports Pub. 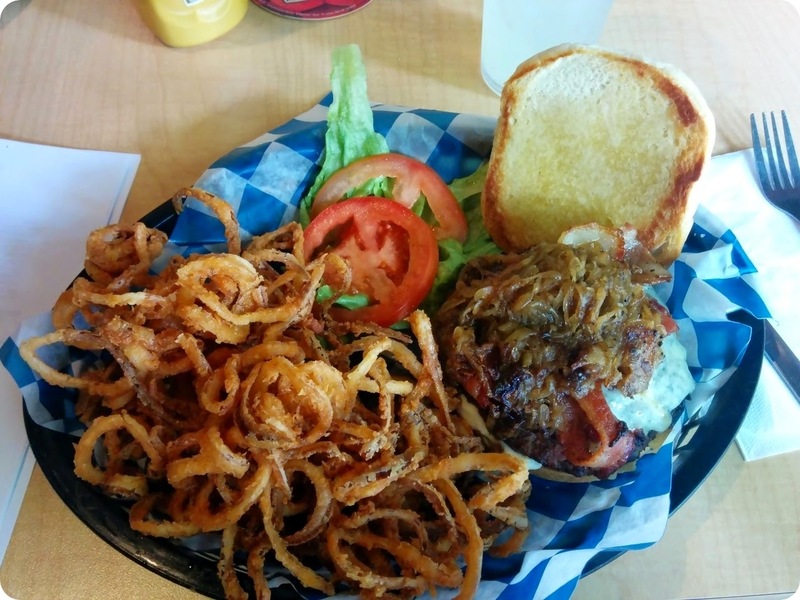 Huge burger with sliced blue cheese, bacon, and caramelized onions. Plus fried onion strings. And (of all things!) lemonade. All courtesy of a vendor. Great way to end a long week. Hopefully leading to a great weekend.